Modern extension and type of permafrost in the northern hemisphere according to the International Permafrost Association (IPA). The different colours indicate different types of permafrost, ice content, etc. Click here for a larger map. Click here to jump back to the list of contents. Air temperature (upper panel) at 3 m height and ground temperature (lower panel) at the surface, and at 1, 2, 3, 4 and 5 m depth on the summit plateau of Gruvefjellet (78.25oN,15.55oE, 464 m asl. ), central Spitsbergen, Svalbard. The permafrost data series (hourly values) start on 3 March 2008. Please note that the two temperature scales in the two panels are not identical. The air temperature typically reaches maximum values around mid July, while the permafrost temperature reaches their maximum later, at 5 m depth around mid November. This time delay of almost 4 months is caused by the time required for heat conduction from the surface to 5 m depth. The Gruvefjellet permafrost station is operated by the Geology Department at the University Centre in Svalbard (UNIS), and is part of the permafrost research project TSP-Norway (Thermal State of Permafrost in Norway and Svalbard). See photo of station below. Last day shown: 1 April 2019. Click here to download the entire data series from the Gruvefjellet station. The meteorological data series begins 30 November 2006, but the 5 m deep borehole with ground temperature recording only became operational from 3 March 2008. Click here to see permafrost temperatures at different depths in the borehole for the last year. Click here to see permafrost temperatures more detailed for the last month. Click here to see present meteorological conditions at the Gruvefjellet station. Wind direction and -speed at 3 m height on the summit plateau of Gruvefjellet (78.25oN,15.55oE, 464 m asl. ), central Spitsbergen, Svalbard. The Gruvefjellet permafrost station is operated by the Geology Department at the University Centre in Svalbard (UNIS), and is part of the permafrost research project TSP-Norway (Thermal State of Permafrost in Norway and Svalbard). See photo of station below. Wind direction and -speed is important for snow redistribution and therefore also for ground temperatures. Last day incorporated in analysis: 1 April 2019. Gruvefjellet meteorological station 20 June 2009, 464 m asl. The borehole with ground temperature thermistors is located close to the rifle to the right of the station. Permafrost research is a young branch of science, and very few permafrost temperatures are found online. At the moment, permafrost data from Gruvefjellet (photo and diagram above) and the nearby Endalen permafrost station (see below) are presumably the only two permafrost sites with online data available. Ground temperatures at the Endalen permafrost station (50 m asl.) in central Spitsbergen, Svalbard. Ground temperatures have been recorded in a 19 m deep borehole since 16 September 2008. 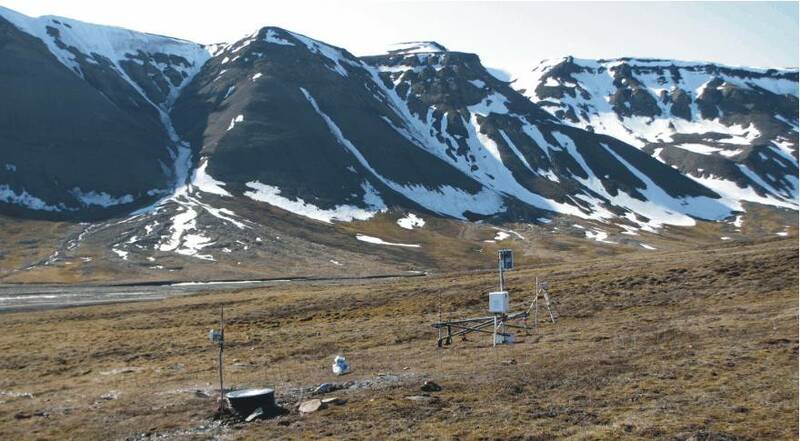 This station is also operated by the Geology Department at the University Centre in Svalbard (UNIS), and is part of the permafrost research project TSP-Norway (Thermal State of Permafrost in Norway and Svalbard). See photo of station below. Last day shown: 30 April 2016. Last diagram update: 8 May 2016. Click here to download the entire data series from the Endalen permafrost station since 16 September 2008. Then click on 'ENDALEN_PERMAFROST' in the left hand panel. Click here to see other diagrams displaying permafrost temperatures at the Endalen permafrost borehole. Then click on 'ENDALEN_PERMAFROST' in the left hand panel. Permafrost borehole (left foreground) in lower Endalen, central Spitsbergen. The other installations relate to measurements of ground resistivity, soil creep (solifluction) and automatic digital photography. 21 June 2009, looking south. Ground and permafrost temperatures are important for evaluating the snow avalanche risk in high relief areas, such as Svalbard. Click here to obtain more information on the CRYOSLOPE SVALBARD snow avalanche research project, including past and present observations on avalanche activity in the Longyearbyen region. Svalbard has the longest meteorological record (since 1912) from the high Arctic. Click here to see the complete meteorological record from Svalbard. Click here and here to see examples of the influence of sea ice and urban heat island effects on recorded air temperatures in Svalbard and around the main settlement Longyearbyen. Permafrost or perennially frozen ground is defined as ground which remains at or below 0°C for at least two consecutive years. In the Northern Hemisphere, the permafrost regions occupy approximately 23 million square kilometres (24%), with actual permafrost areas underlying between an estimated 12 and 17 million square kilometres, or approximately 12 to 18 % of the exposed land area (areas beneath ice sheets and ice caps are not included in this estimate), principally at high latitudes. In the Southern Hemisphere, permafrost underlies some 100 to 150 thousand square kilometres in the mountains of South America, and an estimated 49 thousand square kilometres beneath ice-free land south of 60oS latitude. A key characteristic of permafrost is the presence of ice in the ground, although the definition of permafrost do not require ice to be present in permafrost. The ice in permafrost occurs in a variety of forms and often in large masses of relatively pure ice. Permafrost is overlain by a seasonally unfrozen layer, the active layer, which is not part of the permafrost itself. The presence of permafrost is a primary factor hydrologically distinguishing Arctic from temperate watersheds. In summer, only the topmost 0.5-2 m of ground thaw. Since the water cannot readily drain away, this seasonally thawed layer (the active layer) often remains waterlogged for extended periods. In context of the climate change issue, it is of importance to investigate the thermal response of the active layer and near-surface permafrost to seasonal and climatic change. The active layer, vegetation cover, organic mat, and seasonal snow-cover all act as a buffer between the atmosphere and the permafrost. Although the active layer in most cases is quite shallow (0.5-2 m), it plays a crucial role in arctic hydrology, because most of the water that is available for plants moves either over or through this layer (Kane and Hinzmann 1988; Woo et al. 1992; Brown et al. 2000). By this, the active layer is of paramount importance for all terrestrial biological and geomorphic activity in the Arctic. Since trace gas emissions from tundra areas depend on the active layer thickness, an increased depth of summer thaw could result in carbon loss from the arctic ecosystems, providing a potential positive feedback for carbon dioxide and methane in the atmosphere (Oechel et al. 1993). It should be borne in mind, however, that any air temperature change is likely to be associated with other changes, e.g. in cloud cover, wind, precipitation, snow cover timing and -thickness, having effects on geomorphological activity (erosion vs. deposition) and vegetation. Such effects may well be able to either enhanche or cancel out the isolated effect of air temperature change. Permafrost affects a wide range of landscapes and ecosystems, and issues related to hazards and engineering construction work. Because of this broad interest, most permafrost research initiatives are coordinated and results communicated by the International Permafrost Association (IPA), with has members from all nations with permafrost research interest in Arctic, Antarctic or Alpine environments. Existing permafrost temperature records are still short (see diagram below), and the relation between air temperature, wind speed, snow cover, etc, still subject to scientific investigations. In general, however, there is little doubt that ground temperatures in the uppermost layers of permafrost tend to follow changes of air temperatures, especially when seen over a period of 3-5 years, or longer, and especially at windswept sites. Global simple running 37 month average surface air temperature since 1979 according to Hadley CRUT, a cooperative effort between the Hadley Centre for Climate Prediction and Research and the University of East Anglia's Climatic Research Unit (CRU), UK. Insert shows a number of selected long permafrost temperature series, obtained at shallow depth (Koç et al. 2009). The length of existing permafrost temperature series is still short, compared to meteorological air temperature series. Please note that the permafrost temperature diagram uses two different temperature scales, both different from that used for air temperatures. Base period for HadCRUT3: 1961-1990. Last month shown in HadCRUT3: October 2009. Latest diagram update: 16 December 2009. Permafrost temperatures are occasionally described simplistic as being more or less controlled by variations in air temperatures. In reality, however, the situation is far more complex. Especially the timing, duration and thickness of the winter snow cover may have large effects on permafrost temperatures. In addition, changes in vegetation may also have influence. How air temperature and winter snow cover have changed in the Arctic during the 20th century are indicated by the diagrams in the table below. Spatial distribution of decadal annual precipitation, surface air temperature, estimated ground temperature, and estimated snow mass balance in areas north of 50oN, in relation to the average for the 20th century. The diagrams in the column labelled "Ground temperature" provide direct indication of decadal temperature change in ground temperatures, in relation to average 20thy century conditions. In permafrost areas (map at top of page), this corresponds to temperature changes in the topmost part of the permafrost, beneath the active layer. The significance of the colours used is described in the text below, and is also indicated in the individual diagrams by a scale. The time range is indicated by a number: 1 = January, 2 = February, etc. Click on the individual small diagrams to open full-size diagrams north of 50oN. Similar temperature diagrams showing both polar regions since 2005 can be seen by clicking here. Data source: NASA Goddard Institute for Space Studies (GISS). In the table above with clickable maps the decadal temperature and precipitation is compared to the average conditions for the whole 20th century, to indicate likely changes in ground and permafrost temperatures. In the precipitation diagrams (column 2-4) yellow-red colours indicate less precipitation than what was the average for the 20th century, while blue colours indicate higher precipitation than the average. During the cold season, when much of the precipitation falls in the form of snow, precipitation records may underestimate the real amount of precipitation, because of under catch by precipitation gauges. Measuring solid precipitation correctly is still a major meteorological problem, and it is very likely that the real amount of winter precipitation is higher than shown in the diagrams below. To analyse the effect on ground and permafrost temperatures, induced by changes in air temperatures and precipitation, a series of maps showing the decadal temperature changes are shown in column 5-7, displaying decadal conditions compared to the average 20th century conditions. Warm colours indicates areas with higher temperature during the decade considered than the 20th century average, while blue colours indicate lower than average temperatures. The two rightmost columns (8+9) show the calculated large-scale effects on ground temperatures and net accumulation of snow (~ glacier mass balance). These diagrams, because of the scale used, ignore all local effects on snow cover and insolation derived from wind, topography and vegetation. They should therefore not be over-interpreted as to their detail. In the ground temperature column (column 8) MAGST is short for mean annual ground surface temperature . Blue colours indicate areas where MAGST are below the 20th century average in the decade considered, while warm colours show areas where MAGST is estimated to have been higher than the average. In permafrost regions, this would imply decreasing and increasing temperatures in the topmost part of the permafrost, respectively. The ground temperature change is calculated by considering the likely change in winter snow cover thickness from changes in precipitation, and using this information to calculate the N-factor (Smith and Riseborough 2002). The N-factor indicates the degree of thermal insulation of the ground surface from variations in air temperatures above. Together with the air temperature change, the N-factor makes it possible to estimate the corresponding change in ground surface temperature. Lower than average MAGST will indicate better than average 20th century conditions for permafrost, providing conditions for formation of new permafrost. Higher than average MAGST will have the opposite effect, leading to warming and degrading permafrost during the decade considered. In the snow mass balance column (column 9) warm colours indicate areas where seasonal snow will tend to disappear early in the year during the decade considered, compared to average 20th century conditions. Blue colours indicate areas where the seasonal snow cover will disappear later in the year than average 20th century conditions. For areas with glaciers, these two criterions correspond to below-average and above-average glacier mass balance compared to average 20th century conditions, respectively. The snow mass balance change is calculated by considering the corresponding changes in cold season precipitation and warm season air temperatures. Higher cold season precipitation (snow) will tend to improve the overall annual mass balance, while higher warm season air temperatures will lead to increased melting of snow and ice, and thereby have the opposite effect. A degree-day factor of 3.8 mm w.e. has been used in the calculations of summer ablation (melt and evaporation). As mentioned above, neither this nor the neighbouring ground temperature diagram should be over interpreted with regard to their details. The complexity of climatic change during the 20th century is apparent from the diagrams above. Some Arctic regions may become wetter, while other nearby simultaneously become more arid (dry). Some may become warmer, while other nearby simultaneously become cooler. Clearly the configuration of jet streams and local wind conditions by orographic effects often exercise the main control on the amount of recorded precipitation changes at individual sites (column 2-4), while the influence of air temperature is smaller. At the same time, there is a overall tendency to relatively low precipitation at many sites until the end of the Little Ice Age in the early 20th century, perhaps associated with low air temperatures. On the other hand, the cooling period 1941-1980 appears to have been characterized by generally increasing precipitation in many regions north of 50oN, which is in contrast to what would be expected from the air temperature change. Following the general late 20th warming (here: after 1981), precipitation apparently has continued the overall, slow increase. It remains to be investigated how much of the apparent 20th precipitation increase (both during warming and cooling periods) are the result of gradually improved technology to measure precipitation. The ground thermal diagrams (column 8) confirm the general tendency of increasing temperatures in the topmost part of permafrost, as recently documented from several Arctic regions. It is however also clearly seen, that the available 1-15 years of observations on permafrost temperatures only represent very short data series, without long-term significance. As an example, the ground temperature diagrams give reason to believe that presently rising permafrost temperatures in Alaska and parts of Siberia may well have been preceded by 20-30 years of decreasing ground temperatures. In addition, it is likely that there were similar periods of both warming and cooling of ground and permafrost before that. The snow mass balance diagrams (column 9) indicate the overall conditions for snow survival during the summer, and thereby provides indications for the size of perennial snow fields. In addition, these diagrams reveal several geographical features documented by observed glacier variations and glaciological mass balance investigations. As one example, many glaciers in the Alps advanced in the years up to 1923, where a 20th century maximum frontal position was reached, today documented by well-defined moraine systems. After this advance, a period of rapid glacier retreat followed. Another example is the widespread positive mass balance for glaciers in the Alps between 1960 and 1980, a tendency also indicated by the snow mass balance diagrams. Other examples are advancing glaciers many places in Greenland between 1980 and 1990, and positive mass balance for glaciers western Norway 1990-2000 due to high winter precipitation. Since 1966 the International Permafrost Association (IPA) has organized international conferences on permafrost. The latest conference, the Ninth International Conference on Permafrost, was held in Fairbanks, Alaska, June 29 - July 3, 2008. Click here to download one or all of the proceedings from permafrost conferences since 1966 (free). Click here to purchase the printed version of proceedings from one or all permafrost conferences since 1966.